This is the Koch & Droge Piano Co., Inc., 1096 Broadway, Brooklyn, New York. 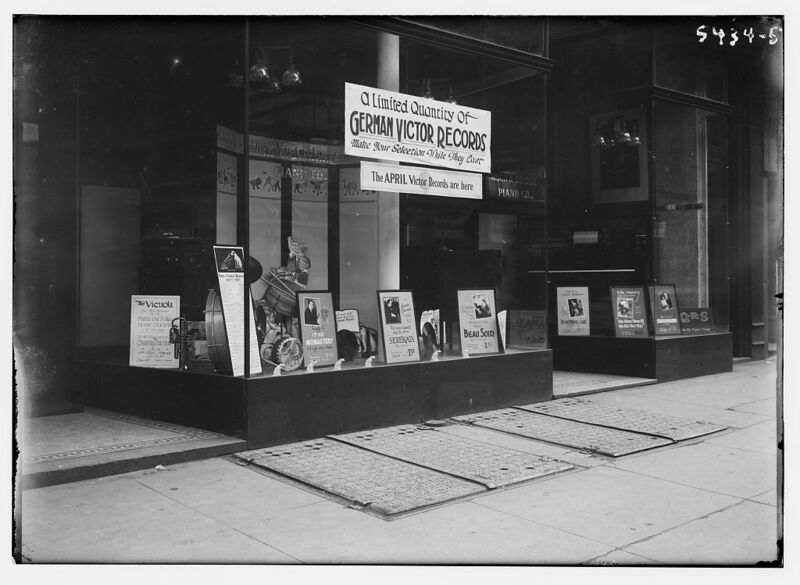 Same image in newspaper clipping from "The Voice": (www.victor-victrola.com/KochDodge.htm) The records advertised in the left display window, are, from left to right, baritone Titta Ruffo, The Monastery (Munasterio) on Victrola 87323; tenor Enrico Caruso singing "Serenata" (Memoirs of a Concert), on Victrola 88628 (recorded September 11, 1919), and baritone Guiseppe Di Luca with "Beau Soir" on Victrola 64934, which was recorded on March 21, 1919. All three records were released in April 1921 and cost $1.25. The left poster in the far right window bills contralto Louise Homer and her daughter, soprano Louise Homer, singing "Oh Morning Land", recorded April 30, 1920 and released on Victrola 87575 in April 1921. The middle poster on the far right advertises Billy Murray, "She Gives Them All The Ha! Ha! Ha! ", which appeared on Victor 18732, also in April 1921. Since this record was part of Victor's popular black label series, it only cost 85 cents (www.youtube.com/watch?v=aOpHOqCZ0e4). This is followed by a song called "Serenade", probably the version by violinist Efrem Zimbalist, which appeared also in April 1921 on Victrola 64936. Accordingly, the big list with the Nipper dog in the left front corner must advertise the "New Victor Records April 1921". If the image could be blown up, one would probably find the same records also listed in the "Advance Record Bulletins for April, 1921" in "The Talking Machine World", March 15, 1921, page 183: archive.org/details/talkingmachinewo17bill/page/182 The store advertises the German-language records Victor produced for the immigrant market because the area where the store was, Bedford-Stuyvesant, was at that time still populated by many German-speaking immigrants; in fact, even the names of the store's owners, Koch and Droge, are clearly German. Finally, the advertising panel in the back with the child riding a hobby horse in front of it says, "Give the Children a Victrola of their own!" Victor had their own line of children's records, and with about 1/3 of American households already owning gramophones at that time, it is apparently time to promote buying a second machine for the same household. Wow! Thanks, [https://www.flickr.com/photos/[email protected]] ! What a wealth of information, from the photo itself as well as from other sources. We will update the catalog record with some of these details.